This individually hand-crafted Loss Stone is made of durable glazed pottery which can last a lifetime. At about 1.5 inches, it is sized to fit in a pocket, blessing bowl, or a faith chest. Purchase one or more to gift to others as a meaningful reminder of support and concern during a sad moment. This stone complements the Loss of a Loved One Milestone Module. It is also included in the Blessing Bowl set for Meaningful Moments. In times of sadness and loss we sometimes forget that the key component to a healthy grief journey is a community willing to talk and be present. This is when friends and a community of faith who witness, support, and love a griefing family or individual in their loss can be most helpful. 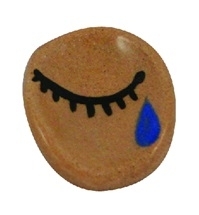 This Loss stone for gifting is an important keepsake for families and individuals to remember and appreciate those who have helped them feel God's presence and support as they continue to experience their grief and sadness.